Lori has been teaching and empowering people in the wellness industry for 20+ years; as a fitness trainer/coach, a BLS Instructor for the American Heart Association and a teacher for The Gokhale Method. Seeing students experience life changing effects by learning The Gokhale Method is the most rewarding aspect of being a teacher. It’s amazing how simple postural modifications can make such a difference and allow you to live a healthy, happy and pain free life! After undergoing a lumbar fusion, Lori was in search for a solution to help manage her lower back pain so she could get back to her active lifestyle. She was thrilled to discover the Gokhale Method. After taking the Foundations Course and implementing the techniques into her life she noticed many positive changes with her body…no lower back pain, sleeping better, breathing better, being able to sit and get up without stiffness or pain, pain-free bending, more energy, walking better and faster, looking leaner/taller and overall feeling healthier. As a fitness trainer over the years Lori has worked with many people who suffer from chronic back, neck, shoulder, knee, foot and hip pain. Through exercise many of her clients found relief but never got to the root of the problem; therefore, still suffered from their pain. After discovering the Gokhale Method, Lori realized that implementing postural changes into your life can help eliminate pain and will lead to improvements to one’s overall state of being, both physically and mentally. Because of the life changing effects she experienced with The Gokhale Method she decided to become a teacher to help others on their journey to a pain-free life. The Gokhale Method can help you too! May 2018 Group Testimonial for Lori Szalay "I have hope!" Rick Brown, Wendy Bransom, Theresa Brown, Candace Barringer, John Huber, "...this is fantastic!" Testimonial for Lori Szalay "I feel more confident in all of my everyday activities." Phylis Floyd, Marji Hare, Ginny Halliburton, and Katrina Lowrey "...I really like it, I feel great." "I just completed the Gokhale Method Foundations course and I feel like it has changed my life. Lori Szalay was a great instructor. Before taking the Gokhale Method Foundations Course, I experienced back pain on a daily basis. After sitting at my computer all day at work, I would come home and lay on the floor to relax my back and then start begging for a back rub. Also, during family outings where we were on our feet a lot (museums, theme parks, etc. ), I often had to take breaks to stretch or sit down to "rest my back." This course has been a true life changer! It took effort to learn the techniques but once I did, suddenly good posture became natural and comfortable instead of feeling like an impossible amount of work. The back pain is now gone, and the posture compliments from strangers are fun too! Lori is an excellent posture coach. She breaks everything down in an easy to follow manner. I felt she was really invested in my success. 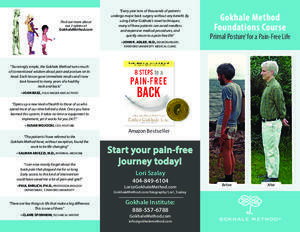 I urge anyone with back pain issues to get in touch with Lori and learn about the Gokhale Method! As a radiologist, I am routinely asked to evaluate xrays, CTs, and MRIs of patients with back pain. Posture and alignment issues are plainly evident on many of these images, and the associated degenerative findings are very common. After surgery, it is common to have patients return for multiple MRIs for continued back pain. As a combined reactive and precautionary measure, I took Lori's class to address my own posture and core weaknesses, which have since greatly improved. My improper bending was causing periodic back strains, and my poor sitting positions were causing unnecessary fatigue and alignment problems. Both of these were expertly addressed by Lori's class, and simple solutions were taught to overcome the many difficulties of modern ergonomics we all encounter. This class is highly recommended. I loved my two day Gokale Method Foundations Course experience! I learned how to sit, stand, and walk in ways that if I continue to apply what was taught, not only will my lower back problems be helped (after the soreness of using new muscles diminishes) but my body image will reflect the form I have always desired – poise and confidence. I think one of the biggest reasons I enjoyed this class so much was because of the teacher, Lori Szalay. Lori’s background as a long time fitness instructor really enhanced the benefits of taking this course. She was able to break down the basic form instructions into easy bite size, do-able tasks. She is engaging, gave a lot of positive enforcement and not only helped us to form our bodies into good posture positions but quizzed us enough that our minds are now formed to remember our instruction. We know our good posture hints and can apply them! Thank you, Esther, for your research and for sharing your method to relieve pain and discomfort! Thank you, Lori, for creating a fun learning environment that has helped me implement this method! I loved your class! It was very complex and very important information to help me heal my years of chronic back pain. I really appreciated how well you broke it all down and helped me take it a small step at a time until it made complete sense and I could do it! I also really loved working with you! Your level of training in the area of physical fitness helped tremendously to explain things better for me. You gave so much of yourself in so many ways: encouraging us as strong women, physically checking our every move to ensure we were engaging the correct muscles, giving us strengthening exercises to help us heal more quickly, being a friend. You have a very fun and inspiring personality. You made me believe I could do it—whatever I had to do and have to still do for the rest of my life. You made it a good time even though it was a lot of hard work. The first day I felt my back muscles shifting (after lessons 1-3). It felt like burning and soreness but was gone by the next morning, which really surprised me. After the second day (lessons 4-6) I felt more free of pain than in a long time. The posture changes are easy to remember thanks to the way you drilled it into us—testing our memory over and over—in a fun way. The practice will stay with me and I am confident I will no longer need steroid shots, physical therapy, or surgery. What a blessing you are and this method is! I will come to a refresher every chance I get, as well as joining in online trainings. I wish you all the best in your work and look forward to seeing you again. PS. I loved your southern girl personality and all the little ways that made me feel very comfortable and confident in the program! I wanted to tell you how AWESOME the Foundations Course was for me. I cannot imagine a better teacher with more knowledge of the body, fitness, and muscular structure. It was the best money I ever spent and will save me from back surgery! What I learned is life changing, because now I know how to protect the spine, stand tall, and actually stretch the spine while I am sleeping! Speaking of sleeping, I have never slept better in my life, my back ache no longer wakes me up at 2:00 AM, it’s a miracle! I will definitely take some refresher courses and am so excited that I have hope for a pain free back! I am using all the specific techniques I learned through the course at work and my body doesn’t get as fatigued. I thought eating right and exercising was the key to health, but NO! It’s knowing how to stand, walk, lay down to sleep, bend, and sit, protecting the spine and using the back correctly. I am looking forward to spending the second half of my life growing taller, stronger, and looking younger! Thanks to YOU." I caught a glimpse of myself in a store window and was horrified. I was slumped forward with my head jutting out- a hump in my neck starting to appear. I asked my doctor and others for any suggestions they might have but the only suggestion was to put a broom handle behind my arms to pull back my shoulders. I saw in the local Patch email for an upcoming Gokhale Method Free Workshop which advertised help with posture in addition to helping relieve back pain. I signed up for the Free Workshop and for the Foundation Course after the workshop. Let me say it is difficult to undo many years of bad habits, but as my excellent teacher, Lori Szalay, kept telling us - it takes time. I finished the six lesson Foundations Course with an awareness of my body and its positioning. With the techniques and exercises Lori demonstrated I hope to be able to reverse some of the damage I've done. In my before and after photos there was an obvious improvement. I think this Course is an excellent use of time and money. I will continue on my own and check back occasionally with Lori for Alumni classes. Having just completed the Foundations Course, I have hope that I can overcome years of poor posture. Lori Szalay explains and demonstrates the positions, but most of all she individually moves our bodies so that we feel the correct positions. She encourages us to practice at home and reminds us that with time, we will win. Each day I now am thinking of how I walk, sit, lay down, stand and bend. I am so grateful that I not only took the Course, but also that I witnessed a fine teacher. I want to thank you for teaching me the Gokhale Method. You were patient, encouraging and exacting. You rehearsed everything with me until you felt that I had mastered every step. You are a great teacher. I am very conscious now in how I sit, stand, bend and walk. Especially when walking, I feel more powerful and strong. And that is such a good feeling. So thanks again! My teacher, Lori Szalay, taught me with the kind of care and interest that can be found only in a person who was once a fellow sufferer. Having helped herself relieve her pain by mastering the Gokhale Method, she has the most genuine faith and knowledge needed to be a wonderful teacher. I continually postponed taking the Gokhale course because I thought nothing could cure my “arthritis”. However, after I met Lori, I began to realize that most of the pain in my spine had nothing to do with arthritis. She patiently helped me learn the wonderful comfort one gets using the Gokhale Method. I needed to remedy the damage I’d inflicted on myself through years of very poor posture and Lori taught me how. Today I’m no longer bound by physical and mental pain. I’m finally most gratefully free! And now that it possible for me to garden pain-free, it has taken up far more time than I expected which is a good thing! I had two 3 Lesson Sessions a few weeks apart with Lori. After reading about it, and studying the book by Esther Gokhale which explains the method for changing and improving one’s posture, eliminating back pain, I felt I had to have a face to face teacher to truly grasp the concepts. Lori was kind enough to travel nearly four hours each way to teach me. She was friendly, but all business, and lost no time in chit chat, instead beginning to teach as soon as she was in the door. She was clear in explaining how to perform the techniques and why those particular techniques helped stretch the back and build the correct muscles to take strain and pressure off the lower back. The course included specific techniques in standing, sitting, lying down, inner corsets, hip-hinging (bending) and walking. I learned a great deal from Lori in the time we had together. Naturally, changing one’s way of carrying oneself and transforming old habits is not easy, and takes time. I’m continuing to practice every day, and continually reminding myself to roll my shoulders back & to use my inner corset. I thank Lori for the patience and clarity with which she taught me. I recommend her without reservation. Lori, Just want to say "thank you" again for your good guidance throughout the Foundations Course. It's provided lots of excellent tools that I feel I can now keep getting more and more adept at using as I work on integrating this teaching into my normal life. Thanks for always bringing your energy, enthusiasm and caring to all of the sessions. A few days after the end of the Foundations Course, I went shopping at Whole Foods and was waiting in the checkout line. All of a sudden I realized, "Oh...I'm standing!" And then I became aware that my weight was centered on the front of my feet. So I shifted the weight to the heels, and almost automatically my body went into a tallstanding posture. I'm not saying that it was perfect, and I'm not sure how many of the 3-3-3 points I consciously tried to do. The main thing I was conscious of was shifting the weight. What was striking was that I immediately felt a wave of ease throughout my body. It kind of went up from the heels to the head. I realized that having the weight on the balls of the feet, by contrast, was stressful. In addition my mood changed. It went from thinking about the future, wondering how long it was going to take me to get through the line, to being content in the present. It was not only a wave of physical ease, but also mental and emotional ease. It was as if a happy body created a happy mind. Since then I've realized that many (and probably all) of the techniques that we have learned create ease in the body if done correctly. Because we're just learning them, they might seem complicated and effortful, but in the end they seem easy and natural. Yay! Thank you, Lori, for teaching us so well. I'm so glad I took this course! This course was great! Every lesson built on the previous week’s lesson and techniques, making it easy for me to grasp. Lori is patient and a great teacher. She educated me on ways to improve my walking, sitting, standing, bending and even sleeping. The best thing about it was the awareness I gained on how to improve my overall back health for years to come. The book is great, but Lori's instruction really brought the concepts to life.